Thodoris is an Oracle Certified Associate Java Programmer and currently works as a Junior Software Developer, for Intrasoft International S.A. He holds a diploma at Informatics & Telecommunications Engineering and is interested in continuous development. Today we ‘re gonna talk about table formatting in JSF. Remember yourself on your very first steps to Web Development, how easy was it to manipulate a table with raw HTML? You had to follow a strict writing with a bunch of specific HTML tags, in order to get what you wanted to. Ok, pretty easier with JSF, but what’s the functionality of <f:convertNumber /> ? Generally, the fore-mentioned tag creates a number formatting converter and associates it with the nearest parent UIComponent; for more information, please refer here. 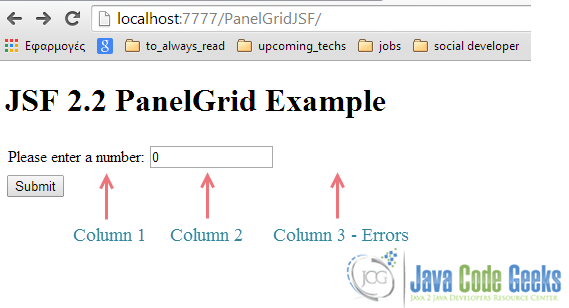 Here is a demonstration JSF app, using panelGrid for the elements’ proper layout. Let’s first insert a string, just to see our app’s exception handling; we ‘ll then insert a number (75 in our case), to conform with the success path.